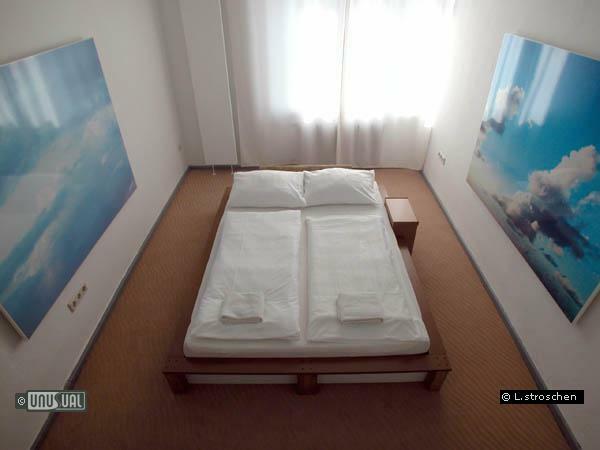 Flying beds and upside down rooms - Amazing creativity in Berlin. 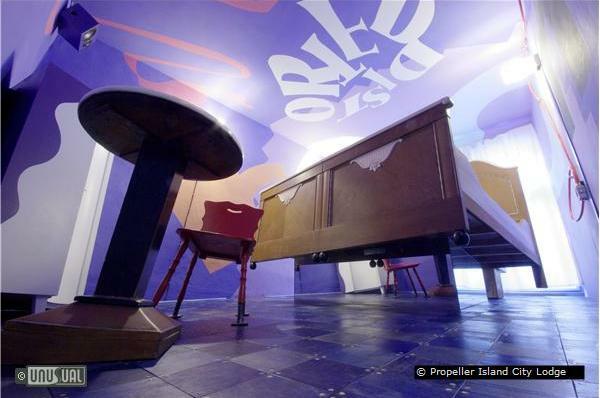 It is with great sadness that GoUnusual announces that Lars Stroschen, creator and owner of Propeller Island City Lodge, has decided to close the hotel on 1st November 2016. Thank you to Lars, Valentina and the team for the many crazy nights we've shared, and experiences we've created for the thousands of GoUnusual guests. We, propeller-island-team, thank you very much for the wonderful years of cooperation and wish you further on success with Unusual & Unique Hotels of the World. This is an extraordinary location. 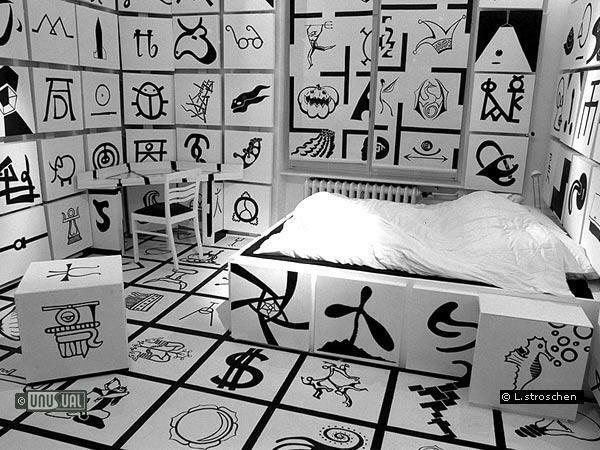 All rooms and objects were created by the German artist Lars Stroschen. Much more appropriate than "hotel" is the designation "living in a work of art". 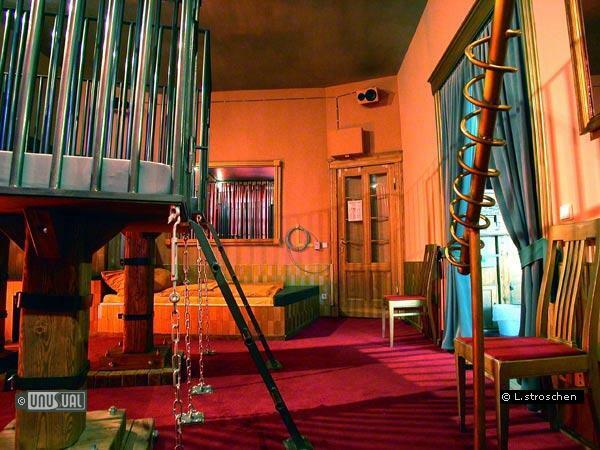 30 rooms with an absolutely unique and personal ambience. "Unique" is meant literally, for the entirety of all furnishings and other objects you will discover here are custom-made, individual handiwork. 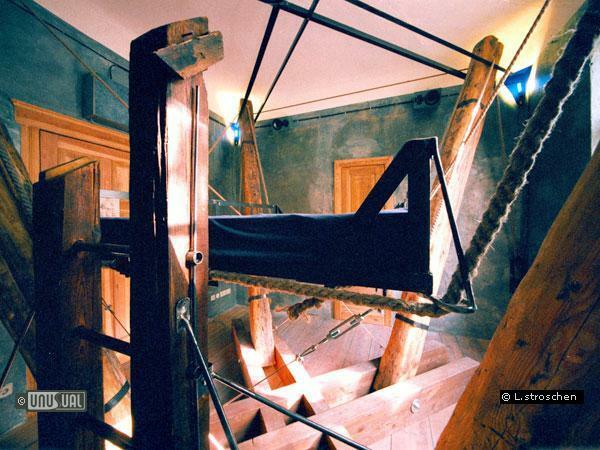 None can be found anywhere else on this planet - one could consider the CITY LODGE to be a MUSEUM with guest accommodations or a stay-in work of SCULPTURE. 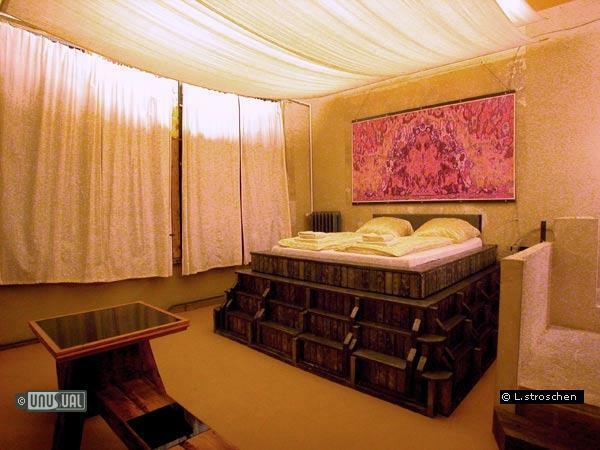 The rooms are designed and constructed without compromise (! ), varying from the tame to the extreme, and provide the opportunity to more or less alter your perspective of reality - according to your taste and sense of adventure. 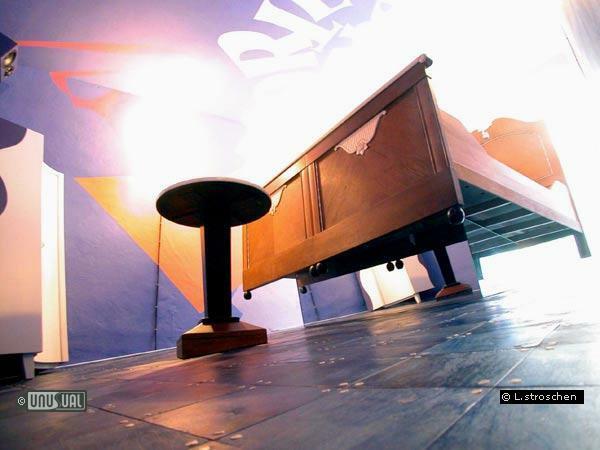 If you have managed to make the right choices, you will experience an unforgettable stay at our place! 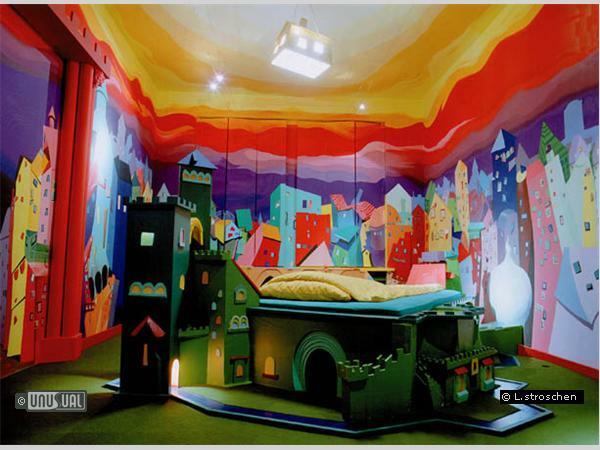 “The Propeller Island City Lodge is a piece of art that was planned to be used as a hotel. However some of the materials are a lot more sensitive than usual: the plexiglass is easily scratched, as are the dark and intense wall-colours when you slide your bags upon them - only to take only two examples. That is the nature of these materials and you cannot change it - except if you want a boring hotel. As a guest of the Propeller Island City Lodge we ask you keep this difference in mind and to move with some care within the artwork. UHOTW love this hotel. It justifies a trip to Berlin on it’s own! 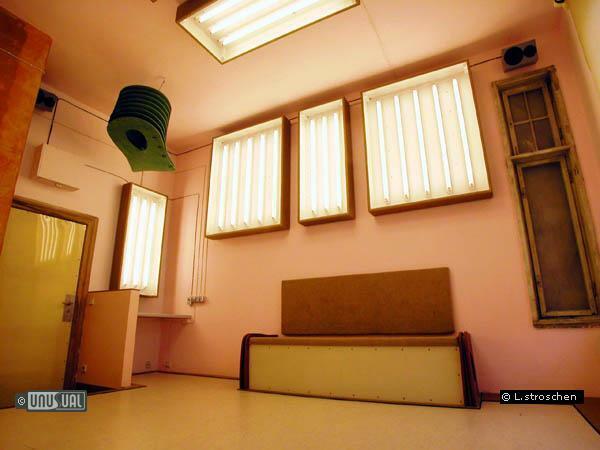 Room examples - these are some of the more outrageous, but there is great variety from fun through funky, to fetish. Definitely one of City Lodge's highlights. 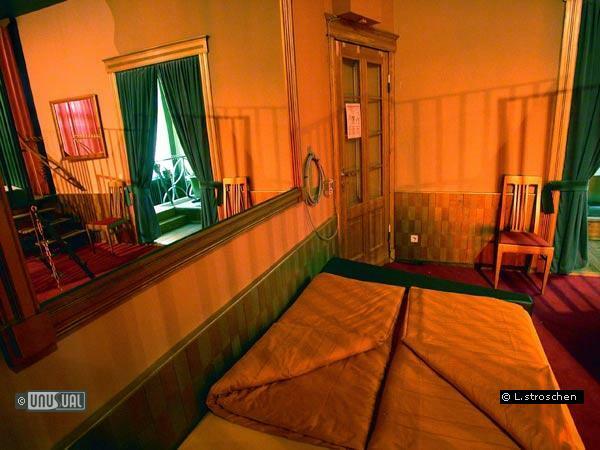 The diamand-shaped room is completely (!) 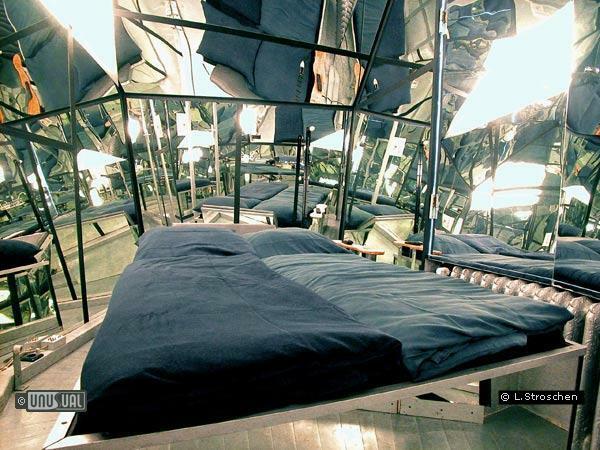 laid out with mirrors and gives you the impression of living in a kaleidoscope. Dual cages, situated in the centre of this spacious menagerie, rest on stilts measuring 1.5 meters tall and await applause from the neighbouring guest(s). Your curtain presides over what your audience sees and what not! Each latticework can be a bedplace for one. 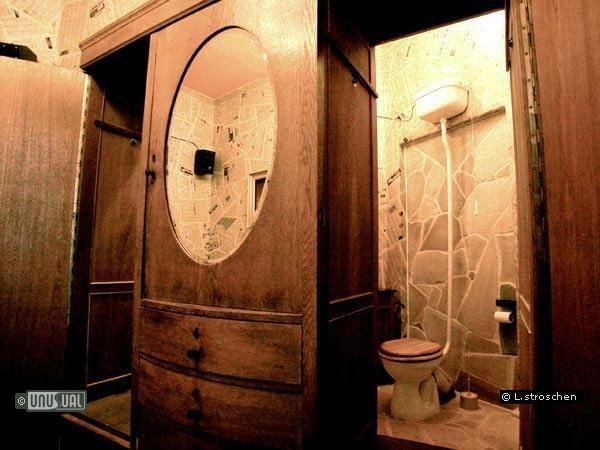 Or there is room or two, vis-à-vis from the opulent and roomy bathroom. The toilet thrones atop a tower and permits voyeuristc peeks into the golden bathtub. In both coffins you can even slumber beneath closed lids! An will be opening soon: exclusively connoisseur room for all those "Nosferatus" who cannot wait for that which awaits us all. Whosoever has second thoughts can creep to the bedplace below, safe within the labyrinth. Not only a unique experience for Gothic die-hards...an exquisite location on top of that! 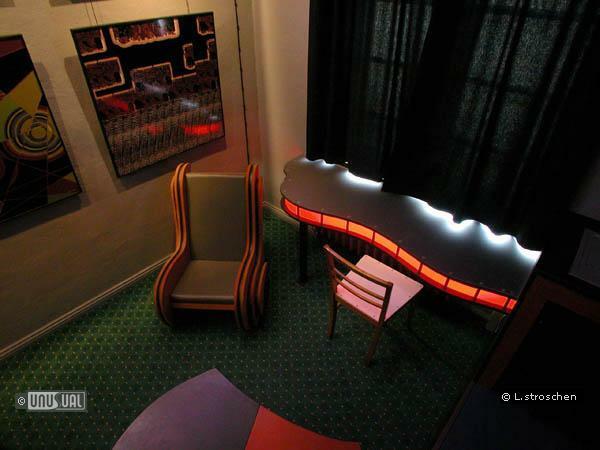 A reception desk in the conventional sense (open 24 hours a day) doesn't exist at the City Lodge, since it would be difficult if not impossible for a modest establishment to offer such exclusive and carefully constructed rooms at reasonable prices for its guests. Instead, there is an office open daily from 8:00 a.m. to 12:00 p.m.. YOUR TIME OF ARRIVAL! Because of the limited opening times we require your time of arrival unconditionally. Then, someone will come (!) to the hotel to open the front door. Your mobile number would be very helpful (that is, if you've brought one along!) in case of any delays or changes in your arriving. Due to the fact that reception office is not always open, Propeller Island would like to make sure hotel keys are not mistakenly taken on your trip home! Your passport, I.D. card or plane ticket can be safely left at our office as security for your hotel keys. Due to spatial considerations, it was not possible to install bathrooms in some of the rooms, as there was only space for a wash basin. 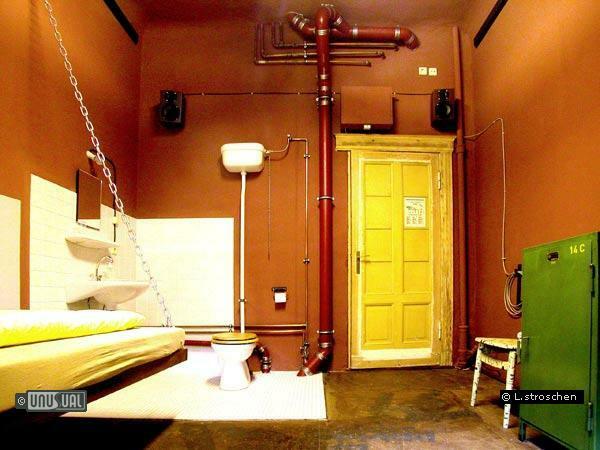 Whoever stays in these rooms can make use of the common bathrooms - cozy but classy - directly adjacent. For your short journey there, we will gladly supply you with a bathrobe! As compensation: these rooms were especially and caringly designed and rank among the most fascinating in the City Lodge. The hotel is just outside the centre of Berlin, but within walking distance of shops, restaurants (including an excellent South American restaurant) and bars. Transport by u-bahn, bus and taxi is cheap and easy. You're 25 minutes by bus from the central Tegel airport, or 45 minutes from the larger Schonefeld. The nearest U-Bahn stop is Adenauer Platz, a 5 minute walk from the hotel. There is a HUGE amount to do in Berlin. Museums, parks, shops, historical sights. If you’ve never been – GO! 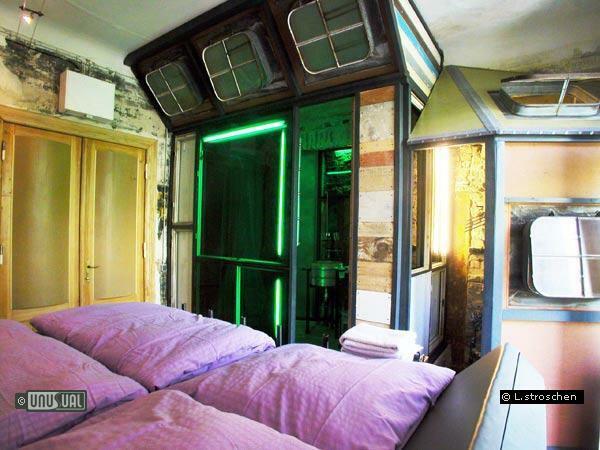 easily one of the coolest rooms in the world! 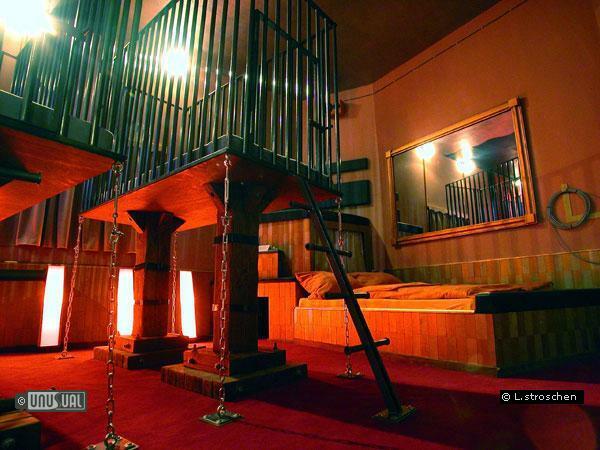 ive stayed here twice .. once in the two lions room (cages) and once in gruft (coffins) .. both times were amazing! I visited the hotel and after seeing so many rooms, I´m still thinking which one I like most! This hotel exudes creativity in each corner. Would love to stay there on my next visit to Berlin. 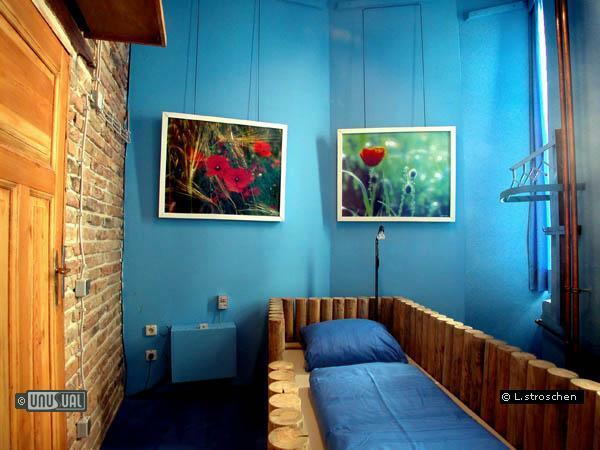 Stayed there 2-3 years ago in the "4 Beams Room", and it was a friendly, clean, lovely place with surprises at every corner and a nice habit between guests. "Show me your room and I'll show you mine". 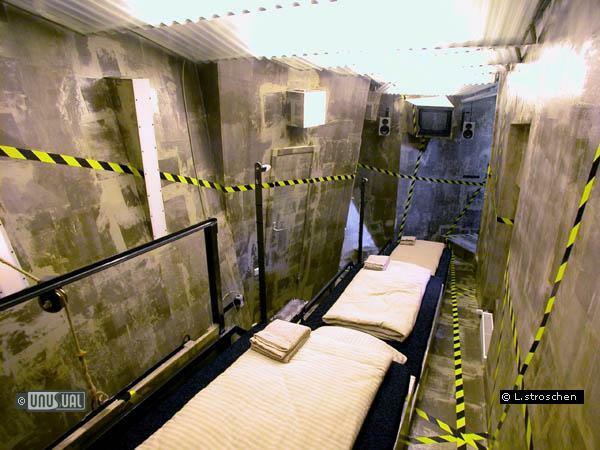 If I ever go in Berlin again I'll surely try a different room. I loved this hotel! I had a wonderful time at the hotel and in Berlin in the spring of '07. I stayed in two different rooms over the course of week to enhance the overall experience. It was well run and clean and accessible to lots of great restaurants, shopping and transit. Stayed here a few years ago in the MineShaft room (a sloping room for four). The imagination is excellent and it's a real stand out experience especially when you find the hotel as it's situated in a fairly anonymous post war block of flats that is so similar to all the other post war blocks of flats in this area. I always recommend it. Location was pretty accessible for getting around Berlin too. It is an amazing place. Designer made and owned. 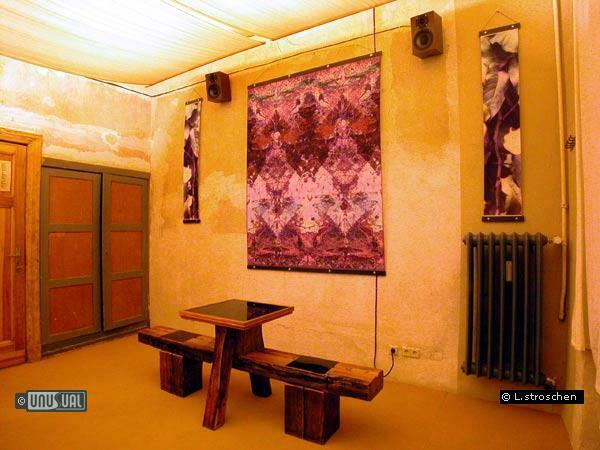 It has its own ambiance music that can be listened in the rooms. A sweet interned corner. A tropical dinning room. Very nice people as staff. Really worth spending there a couple of nights. You have to arrange with them the arriving times.